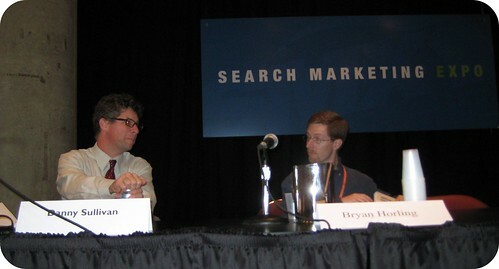 Bryan Horling, Software Engineer, Personalized Search, Google is the only panelist. He starts of with a query. He queried "dinner." The top two results are wikipedia and whatsfordinner.net. He said he is unsatisfied by these results. He then showed the personalized version of the same query and it showed recipes of foods he loves. Search is not a "one fit all" marketplace. He wont talk about: - Search preferences - iGoogle - Customer Search Engine - Subscribed Links - Google Desktop - etc. He then shows off the web history section in Google at http://www.google.com/psearch. It shows you all your search history when you were logged in. You can pause web history and you can also "remove" web history, one by one. Or you can clear your entire web history and Google wont use it to personalize your results. Search Details: Google now shows how they personalized the results at the top right of the search page. They have a link to "more details," which explains which personalization techniques were applied. Works well. Country Localization: Google will use the Google local version engine i.e. Google.com versus Google.co.uk, will show different results based on the country specific engine. Metro Localization: One step down is more specific, such as narrowing the results based on your metro area. City Localization: Such as for searching for weather or pizza. Recent Searches: A search for jordans - most people want the shoes. But there is also a furniture store named that, so if someone searched previously for ethan allan and then immediately changed to search for jordans, it will show the furniture store. I tried it just now and it works. Web History: Searching for galaxy will typically show astronomy related topics. But if someone often searches for soccer related topics, that person may see the soccer team. Previous story: What Is Spam?